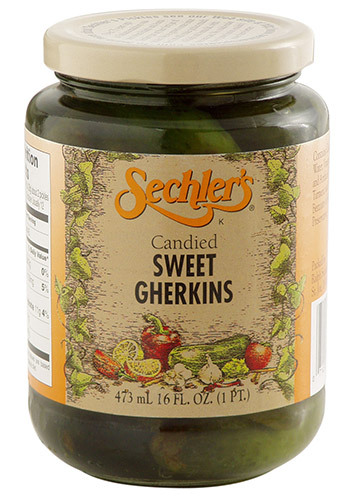 16 ounce Candied Gherkin is a smaller whole pickle that is sweetened twice. From Susan Henke of Greeley, Colorado on 1/3/2019 . From William Hobbs of Sanibel, Florida on 6/8/2018 . Secular pickles are wonderfull, ordered 4 jars and have eaten one already. From Henry Aldrich of East Haddam, Connecticut on 4/19/2018 . From Anonymous of Pekin, Illinois on 3/10/2018 . 6pack Order came very quickly, jars were very sticky from pickle juice. But with a simple wet wipe off care they were great. Fantastic flavor, definitely my favorite. Hard to find in local stores. From Anonymous of Crittenden, Kentucky on 8/11/2017 . Very good! Can't find these within a 50 mile radius, So, purchased directly from Secher's. The shipping is costly, arrived within a few days: but, if you want "Candied" sweet gherkins, well, they are worth the cost!